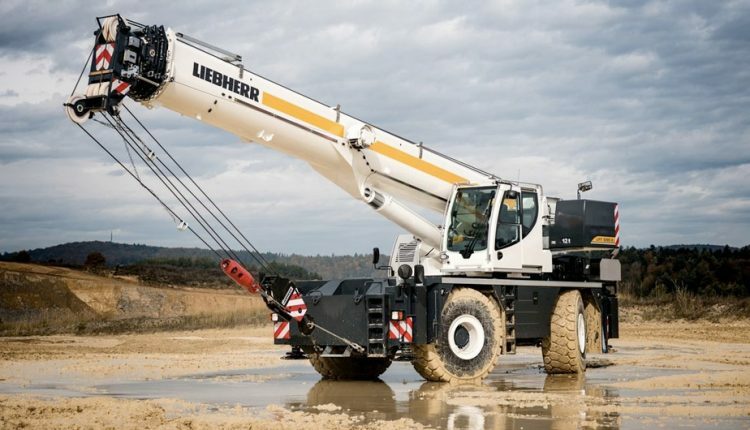 Liebherr presents a new series of rough-terrain cranes. Main development focus was to ensure a high level of safety during use. From the 1980s to mid-90s the Liebherr portfolio included a range of rough-terrain cranes – then called LTL-cranes. These cranes had a lifting capacity of 25 to 80 tonnes. The main focus at that time, however, was to add to the crawler cranes portfolio to build on the company’s global market leadership with various types of cranes. As the market leader in all-terrain cranes and crawler cranes, Liebherr has recently re-supplemented its product portfolio with a rough-terrain series. High safety levels were the main priority for the design of the new Liebherr LRT cranes. The new crane models feature an outrigger monitoring system standardly. The support status – on tires or outriggers – is detected automatically and saved to the crane controller. The attachment of the ballast to the turntable and the installation of the optional double folding jib, including its angle adjustment are also recorded and monitored. Safety is also enhanced by providing greater comfort for the crane operator. For example, the crane cabin is 220 mm (8.5″) wider than other standard cabins on the market. It can be tilted backwards to provide greater comfort when hoisting loads to great heights. The user-friendly controls make the crane easy to handle. They allow the crane operator to concentrate on the main focus of his job, working with the crane and the load. A cooler and USB charging socket are standard features in the cabin. The LRT cranes measure 3.87 m (12’8″) in height and 3.3 m (10’10”) wide and are transported on public roads with a low loader. Their curb weight is less than 55 tonnes (121,000 lbs) with complete equipment including ballast or under 40 tonnes (88,000 lbs) without ballast or equipment. That means that the new rough-terrain cranes from Liebherr can be transported worldwide at low cost. The LRT 1090-2.1 and the LRT 1100-2.1 can be quickly and easily assembled once they have reached the work site. The outrigger pads which remain inside the width of the vehicle contribute to this, since they do not have to be removed for transport. The 100-tonne (110 US ton) LRT 1100-2.1 has a 50 m (164 ft.) telescopic boom with a “Telematik” telescoping system on which the various telescoping sections can be extended independently with a single cylinder and then pinned to the telescopic section above. The telescoping system on the new rough-terrain crane is particularly simple and user-friendly as excellent lifting capacities over the entire radius range can be achieved with just two telescoping modes; Strong mode or Long mode. The counterweights, weighing 14 tonnes (30,800 lbs) ensure high stability. The lifting capacity of the LRT 1100-2.1 is around 15% higher than that of the 90-tonne (100 US ton) model which features 12 tonnes (26,500 lbs) of counterweights. The LRT 1090-2.1 features a 47 m (154 ft.) telescopic boom. Its telescoping system consists of a two-stage hydraulic cylinder with a rope extension mechanism. Similar to the 100-tonne (110 US ton) model the boom can be extended easily with either the Strong or Long telescoping modes. The extension mechanism on both crane models has been designed for high telescoping lifting capacities. A second winch and the rooster sheave are included as a standard feature on the basic machine for two-hook operation. As an option a 10.5 – 19m (34.5 – 62ft.) double folding jib can be installed on the telescopic boom. It can be attached at an angle of 0°, 20° or 40°.